England’s changing seasons and landscape afford a particularly generous accompaniment to my life in Sussex. The artist Clare Leighton shared this delight in the rhythms of nature and the countryside. In the early part of the 20th century there was a revival of wood engraving in Britain. The softness of line and the strength of contrast in the black and white seemed to articulate something particular to a generation of people who were united in their experience of war. 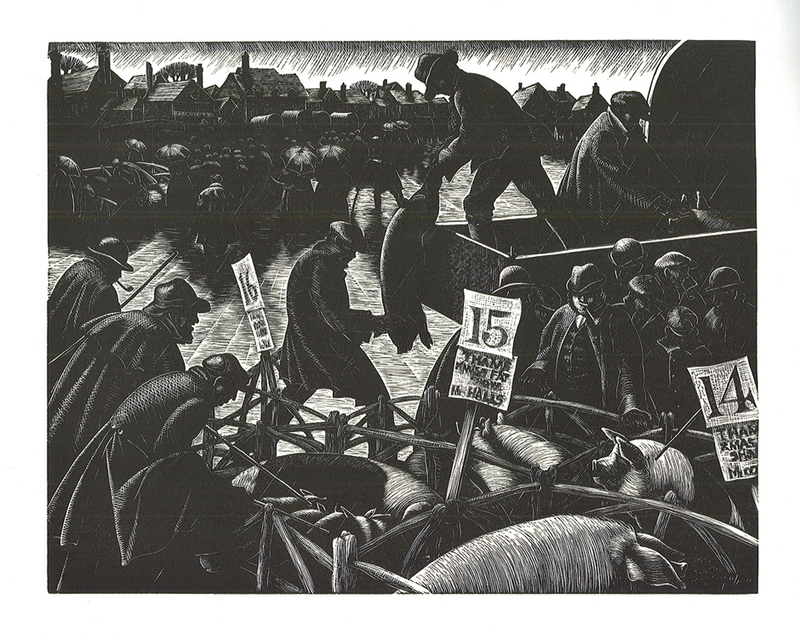 Clare Leighton belonged to this movement and generation. Today she is highly regarded by art historians and collectors. Her work combines a deep understanding of life and love, informed by her Christian faith, with a captivating simplicity and honesty. Many of her compositions are characterized by the use of a series of underlying curves, which at once unite the subjects in her pictures while giving a quality of journeying and movement. Against some opposition from her family, Clare Leighton persuaded her parents to allow her to attend the Brighton School of Art. From there she went to the Slade School of Art, where she studied under Sir Henry Tonks between 1923 and 1924. Needing to earn a living, she left the Slade and enrolled for evening classes at the Central School of Arts and Crafts. She was friends with Hilaire Belloc, who lived at Shipley windmill near Horsham, and Eric Gill, who was at this point living in Ditchling. Before the war she wrote and illustrated a series of books, which included The Farmer’s Year (1933) and Four Hedges: A Gardener’s Chronicle (1935). They reflect her fondness for the countryside and her empathy with rural workers and their husbandry. Although her work is modern, it follows in the rich tradition of English Romanticism. 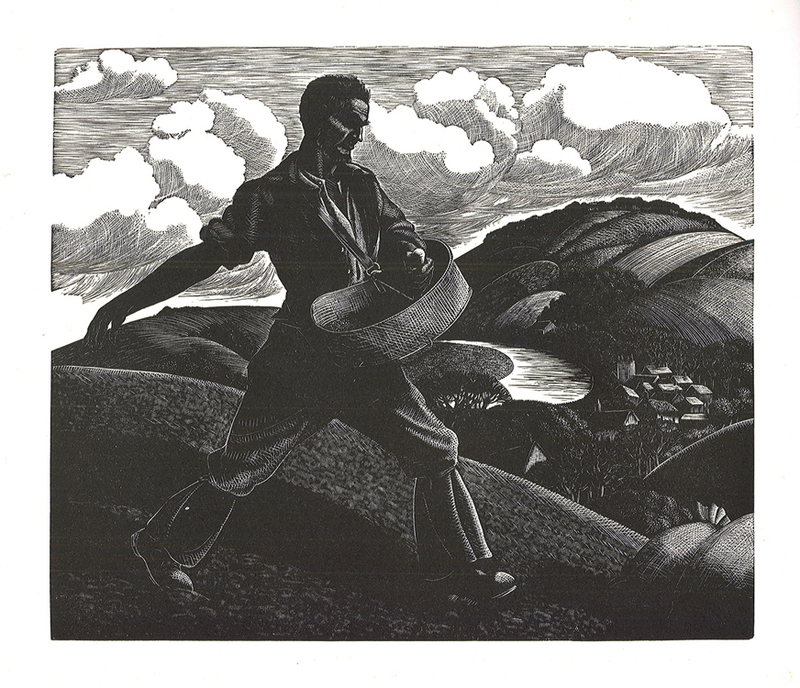 In Clare Leighton’s ‘April, Sowing’ from The Farmer’s Year, the curve of the sower’s posture implies movement and unites him with the folds of the hills beneath the scudding clouds, which are reflected in the river. 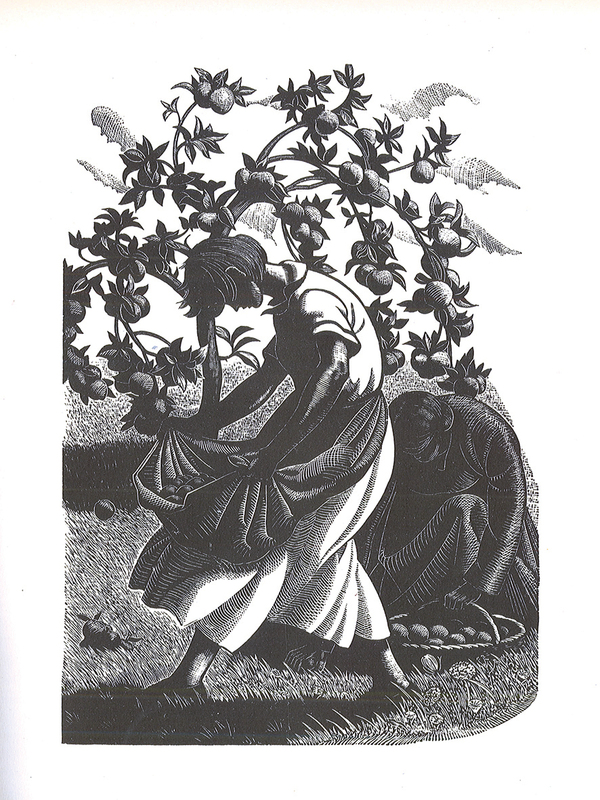 Leighton carves her woodblock with great skill and delicacy, creating mass, light and shade through the use of crosshatching. The curved compositional forms and quality of tone are again beautifully illustrated in ‘A Lap Full of Windfalls’ from Four Hedges: A Gardener’s Chronicle. Here is an artist connected with her life and times, the countryside and its people, all of which inspired her to give expression to life and love through her woodblock prints. Clare Leighton’s decision to emigrate to America in 1939 was bound up with her decision to end her relationship with the journalist and writer Henry Noel Brailsford. She settled in North Carolina and enjoyed a full artistic career, which included teaching at Duke University. Clare Leighton’s work is represented in many national collections, including the British Museum in London and the Metropolitan Museum of Art in New York. Nick and I are excited that Toovey’s is supporting the exhibition Clare Leighton: Working Life, which has just opened at Pallant House Gallery in Chichester. This excellent show has been organised by Simon Martin and provides a wonderful opportunity to see a breadth of Clare Leighton’s work. 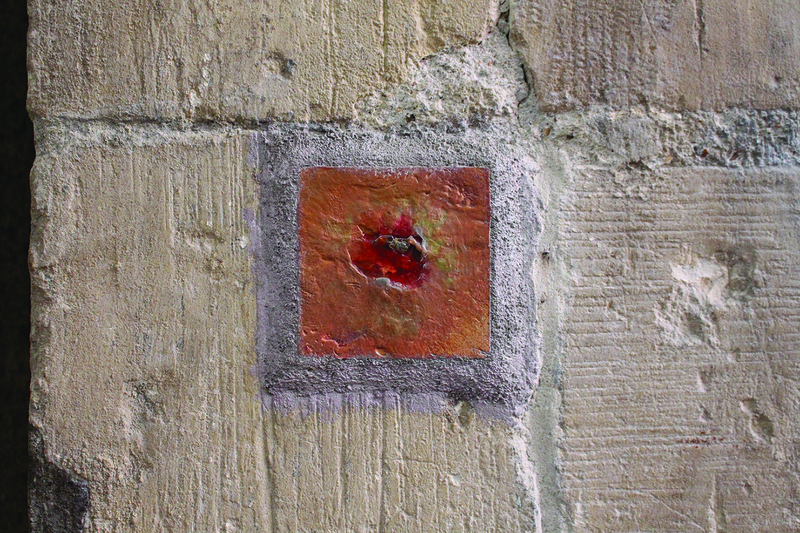 It runs until 24th February 2014; for further information go to www.pallant.org.uk. By Revd. Rupert Toovey. Originally published on 18th December 2013 in the West Sussex Gazette. We close for Christmas at 11.30am on Friday 20th December. We reopen for pre-sale viewing of our End of Year Sale on: Monday 30th December from 10am to 4pm and the sale day: New Year’s Eve, Tuesday 31st December, from 9am to the start of each session. All enquiries regarding this sale will be answered on our return. After the sale, we are then closed on Wednesday 1st January. We return to our normal opening hours on Thursday 2nd January. 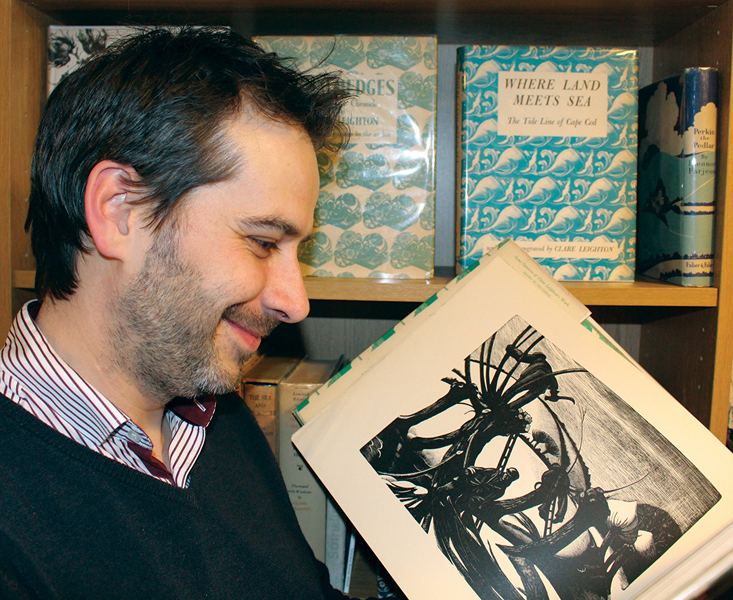 Here in West Sussex, many of the thriving collectors’ fields are informed by childhood passions. The land speed record attempts were particularly evocative for those growing up between and just after the First and Second World Wars. “I remember watching Donald Campbell demonstrating his Bluebird CN7 land speed record car at Goodwood motor racing circuit, Sussex, in July 1960,” recalls Toovey’s consultant toys specialist Gordon Gardiner with customary enthusiasm. Competition for the world land speed record was particularly strong during the inter-war years, as a select group of courageous gentlemen drivers pushed themselves and their cars to the edge of endurance. 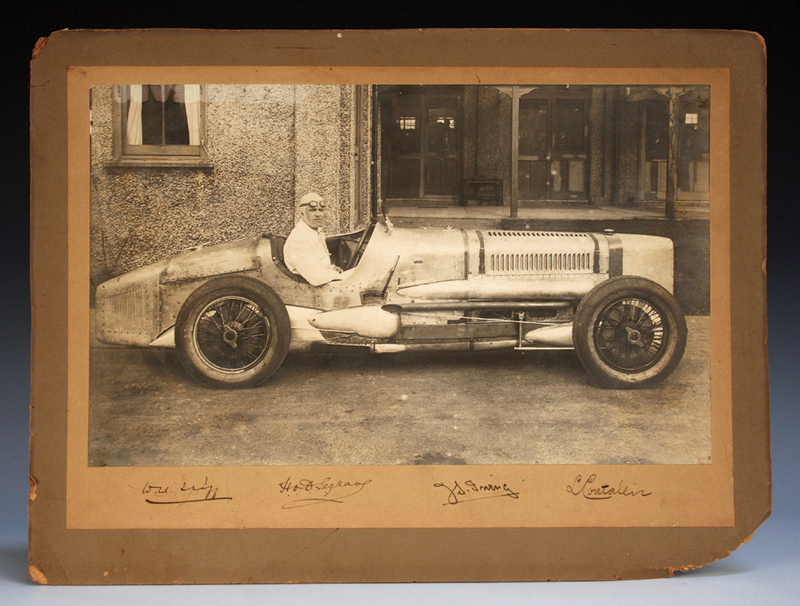 Among these drivers were men like Henry Segrave and Malcolm Campbell, Donald Campbell’s father. These successive attempts to become the fastest men on land were celebrated in a mood of patriotism and national pride. Their bravery and achievements inspired a generation of boys. Our interest in their triumphs continues to fuel our appetite for toys and paper collectables relating to the pursuit of speed. A black and white photograph of Sir Henry Segrave in his 4 litre V12 Sunbeam land speed record car. Interest in land speed record-breakers is strong in other collectors’ areas as well. 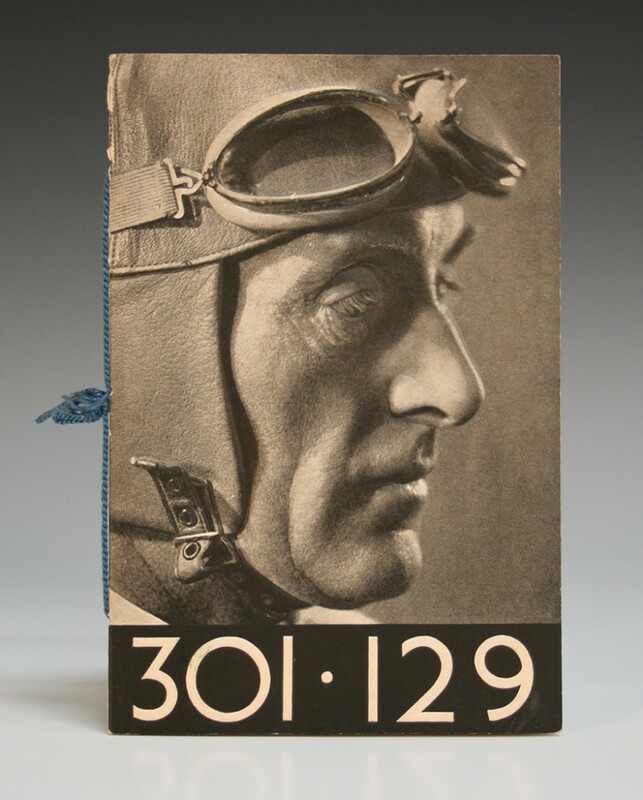 Take, for example, the menu for a banquet in honour of Sir Malcolm Campbell, ‘as a tribute to his achievement in setting up the New Land Speed Record of 301.129mph at Bonneville Flats, Utah, USA’. It is dated September 24th 1935 and has a bas-relief photograph cover depicting Sir Malcolm. The black and white photograph also illustrated here shows Sir Henry Segrave at the wheel of his 4 litre V12 Sunbeam, which broke the land speed record at 152.33mph in 1926. The card mount is signed in ink by Segrave and other key members of the record-breaking team. Both lots were sold in specialist paper collectables auctions, headed by Nicholas Toovey, for £100 and £300 respectively. Returning to Toovey’s toys department, I am interested to know what it is about old toys which delight collectors. “Part of it is fulfilling childhood dreams,” says Chris, “but it is also about their interests – particular vehicles, for example, or a certain historical period.” He continues with a smile, “Toy collectors are really generous with their knowledge and their enthusiasm, which is contagious.” I agree. Collecting is often about the acquisition and sharing of knowledge but it is also about community and sharing interests with fellow enthusiasts. After all, lively minds make open hearts! 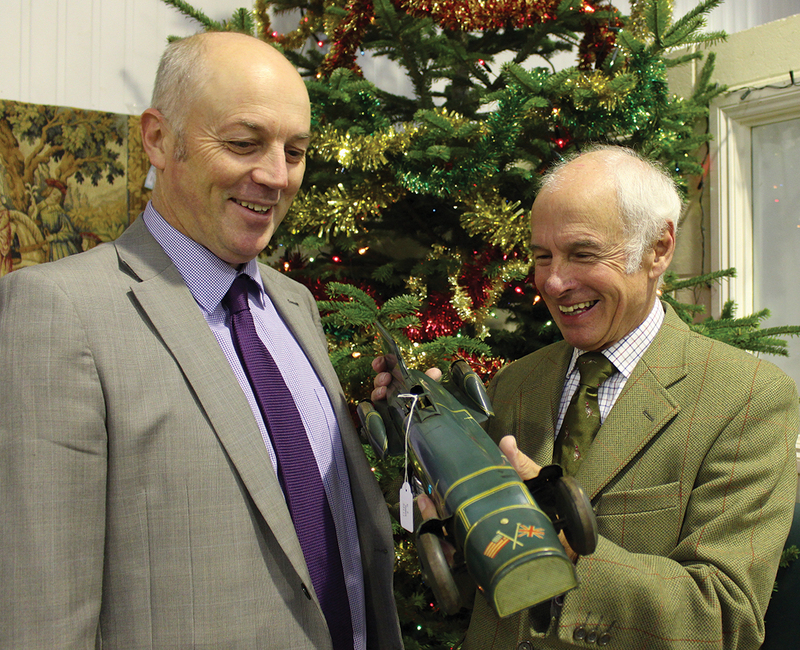 Chris Gale and Gordon Gardiner are already gearing up for their spring toy auction, which will be held on 25th March 2014. 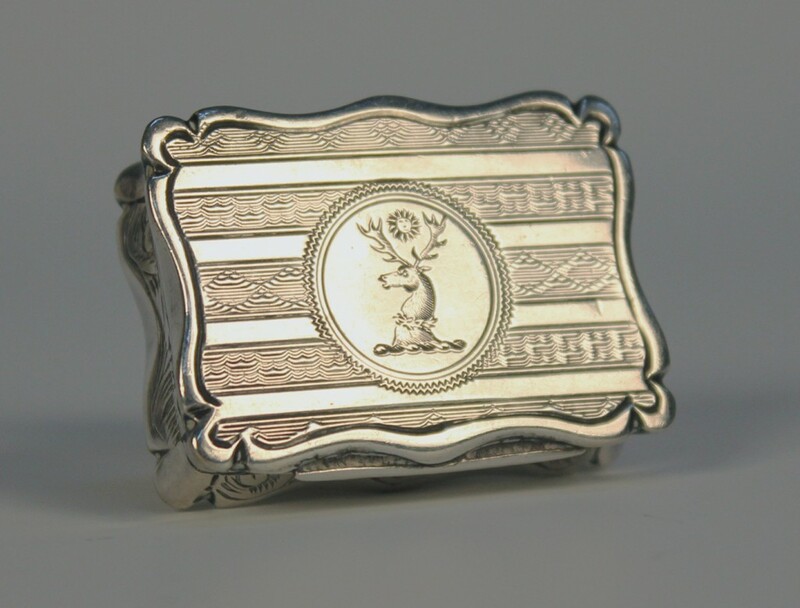 Nicholas Toovey’s next paper collectables auction will be on 22nd April 2014. All are delighted to share their specialist interests with you and offer advice. They can be contacted at Toovey’s Spring Gardens salerooms at Washington. By Revd. Rupert Toovey. Originally published on 11th December 2013 in the West Sussex Gazette. Francis Bacon, Henry Moore – Flesh and Bone is an extraordinary exhibition, currently showing at the Ashmolean Museum in Oxford. The exhibition brings together the work of two of the most important Modern British artists of the 20th century, Francis Bacon (1909-1992) and Henry Moore (1898-1986). Henry Moore’s work, especially from the earlier part of his career, like Madonna and Child, carved in the warm hues of Hornton stone in 1943 and 1944 for St. Matthew’s, Northampton, conveys to me a quality of reverence, universal hope, strength and endurance. The theme of mother and child is one Moore would return to often, especially after the Second World War. For many, Francis Bacon’s figures offer a nihilistic world view; the bones of his subjects have a dissolving, disintegrating effect, suggesting an arbitrary existence subject to chance. Indeed, some people find Bacon’s images profoundly disturbing. The Ashmolean Museum’s Head of Exhibitions, Agnes Valenčak, however, provides an alternative view. She argues that it is not Henry Moore but Francis Bacon who best captures human suffering with understanding, integrity and empathy. Agnes has spent a considerable amount of time exploring and researching the body of work represented in this exhibition. Her perspectives offer fresh insight. While acknowledging the hope expressed in Moore’s earlier sculptures, Agnes says, “I find Francis Bacon’s work less harsh than Henry Moore’s. A lot of Bacon’s images appear painful but show a deep understanding and tolerance.” The Francis Bacon triptych Second Version of Triptych 1944 was painted in 1988. Agnes notes two differences from the original 1944 triptych: “Bacon is copying himself, as with the work of earlier artists. There are few changes, dimensions – a formal choice. He hardly changes the figures between the first and the second but there is more space in the composition.” The later version is larger than the original version and less cruel. The bared teeth of the person in the central panel are reminiscent of the horse in Picasso’s Guernica. The figures have a deformed physical appearance. Francis Bacon chose to subvert the Christian iconography and the title of the 1944 triptych Three Studies for Figures at the base of the Crucifixion by identifying his distorted figures with the vengeful Greek Furies from classical mythology, who lacked mercy and forgiveness. In all this, Bacon the atheist was challenging us to remain open-minded and questioning about the ‘lenses’ through which we view the world. As a Christian, I feel an empathy with this triptych nonetheless. Francis Bacon captures this bleak moment in the Easter story, filled with cruelty, suffering, anguish and sorrow as Christ dies on the cross, attended by his mother St. Mary, St. Mary Magdalene and St. John. It is an image devoid of hope. At this point in the narrative, Christ’s resurrection is still unknown; it has not yet happened. Francis Bacon, Henry Moore – Flesh and Bone runs at the Ashmolean Museum, Oxford, until 19th January 2014. Agnes Valenčak’s inspiration and hard work deserve to be celebrated. This courageous and exceptional exhibition explores what it is to be a human creature through the work of these two great 20th century British artists, who speak with a directness and an honesty which challenge us. 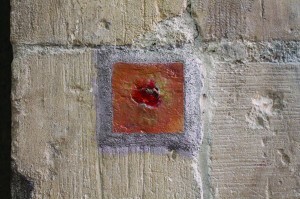 It is, however, an exhibition which, like Michael Clark’s Wounds of Christ, speaks of both hope and sorrow. These works help us to glimpse the complicated beauty of being human. I cannot recommend this exhibition highly enough to you; for further information go to www.ashmolean.org. The Wounds of Christ can be seen at Chichester Cathedral, which is open daily, and admission is free. 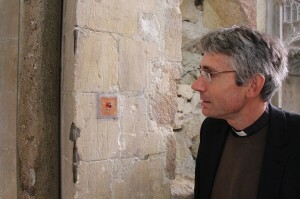 To find out more about services and events go to www.chichestercathedral.org.uk. By Revd. Rupert Toovey. Originally published on 4th December 2013 in the West Sussex Gazette. Our annual End of Year Sale is always a highly popular event in the auction calendar. Toovey’s are one of only a handful of UK auction rooms to hold a sale between Christmas and the New Year and, indeed, the only one in the South this year! For that reason, there is always particularly enthusiastic support for the sale, from both the antique trade and private collectors. Traders are always keen to return to work and seek out new stock as soon as possible after the Christmas period. Many of our private clients, who are not always able to attend weekday auctions, are still on their festive break and the sale always attracts a new audience of curious browsers, eager to experience their first auction and escape the Christmas television! There will be a good selection of art, furnishings, silver, jewellery, collectors’ items and rugs on offer and it will be a lively and full day of sales. As always, our café will be open throughout the view day and the sale day. All are welcome for viewing of the sale at our Spring Gardens Auction rooms on Monday 30th December between 10am and 4pm. We open at 9am on Tuesday 31st December for a quick preview before the auction starts at 10am. The catalogue will be online for a digital preview by Friday 20th December. We are closed for the festive period from Friday 20th to Sunday 29th December and all email enquiries regarding the sale will be replied to after our return to work on Tuesday 30th December. If you would like to enter items in the sale, we’ll need to view and value them by Friday 13th December at the very latest. The sale is always oversubscribed so bring them sooner, if you can, to be sure of inclusion. Our valuations reception is open between 10am and 4pm from Monday 9th to Friday 13th December.